An RSS feed (or news feed) is a means by which you can stay informed about what's going on at Deep South Chorus without having to regularly visit the website. Most Improved Chorus of 2018! Who is Deep South Chorus? 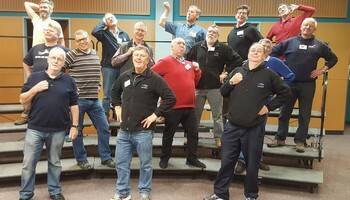 Hobart's premier men's close harmony chorus. We provide opportunties for men of all ages and walks of life to engage in cameraderie and friendship whilst exploring their voice. Ranging from lively uptunes to emotional ballads, there is a style and group for everyone. We rehearse every Tuesday evening at 7:15pm, under the Church fo Christ, 8 Goulburn Street, Hobart. Want Deep South Chorus to sing at your next function? Why not hire Deep South Chorus to entertain at your next event? We can perform at corporate functions, charity events, community Entertainment events, birthday parties, christmas parties, awards nights, weddings, engagements, anniversaries, engagements, and even funerals and memorial services.